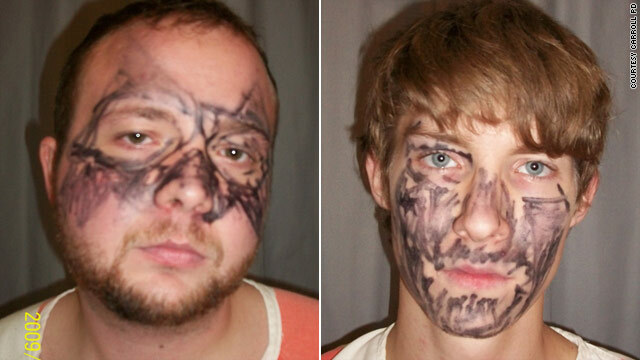 Matthew Allan McNelly, left, and Joey Lee Miller, 20, still had the permanent marker on their faces when they were booked. Police chief: "We're very skilled investigators and the black faces gave them right away"
(CNN) -- Police say guilt was written all over their faces. Police received a call Friday night that two men with hooded sweatshirts and painted faces had tried to break into a man's home in Carroll, Iowa. When police stopped a vehicle matching the caller's description blocks away, they were stunned by the men's disguises. Carroll Police Chief Cayler told CNN the strange disguises made it easier for his officers. "We're very skilled investigators and the black faces gave them right away," Cayler said jokingly. "I have to assume the officers were kind of laughing at the time. I've never heard of coloring your face with a permanent marker." I've seen a lot of things that make me laugh and weird things but this was probably the best combination of the two. "They probably were just not thinking straight and figured we'll go out and scare the guy or whatever," Cayler said. "[They were] being dumb and combine that with alcohol and it was the perfect storm." Both men were charged with attempted burglary, and McNelly was charged additionally with operating a vehicle while intoxicated. Lawyers for the two men could not be reached for comment. Cayler said he's been fielding calls about the case from news media outlets from all over the country -- mostly because of their funny-looking mug shots.